A new international study finds that the Atlantic meridional overturning circulation (MOC), a deep-ocean process that plays a key role in regulating Earth’s climate, is primarily driven by cooling waters west of Europe. “To aid predictions of climate in the years and decades ahead, we need to know where this deep overturning is currently taking place and what is causing it to vary,” said Lozier, who led the international observational study that produced the new data. Scientists from 16 research institutions from seven countries collaborated on the new study. They published their peer-reviewed findings Feb. 1 in Science. 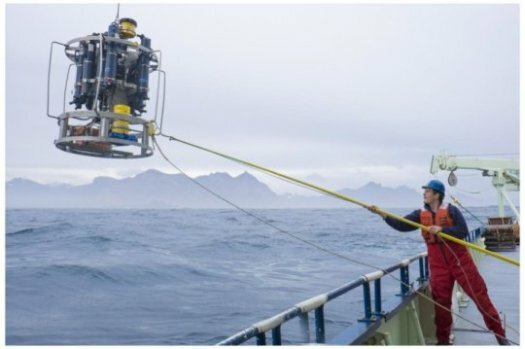 This paper is the first from the $32 million, five-year initial phase of the OSNAP (Overturning in the Subpolar North Atlantic Program) research project, in which scientists have deployed moored instruments and sub-surface floats across the North Atlantic to measure the ocean’s overturning circulation and shed light on the factors that cause it to vary. Lozier is lead investigator of the project, which began in 2014. “As scientists, it is exciting to learn that there are more pieces to the overturning puzzle than we first thought,” said co-author Johannes Karstensen of the GEOMAR Helmholtz Centre for Ocean Research Kiel, in Germany. “Though the overturning in the Labrador Sea is smaller than we expected, we have learned that this basin plays a large role in transporting freshwater from the Arctic,” Karstensen said. “Continued measurements in that basin will be increasingly important,” as the Arctic changes unexpectedly. The new paper contains data collected over a 21-month period from August 2014 to April 2016.